Promotion: Save 10% each on Qualifying items offered by OrangeLeaves when you purchase 2 or more. ALL NATURAL BATH BOMB SET FOR SPA QUALITY AROMATHERAPY AND DEEP MUSCLE RELIEF: Premium Nature is the largest producer of health and beauty products and these unique bath bombs are no exceptions. Loaded with Dead Sea and Epsom Salt, Cocoa Butter and Shea butter these products make for excellent aromatherapy and healing accompaniments. TURN A SIMPLE BATH INTO A LUXURIOUS ESCAPE: Premium Nature Bath Bombs are the perfect fun and fast way to enjoy a luxury bubble bath. Once you drop it in the water it begins to fizzle, releasing healthy and soothing agents that will leave your body feeling renewed. You can give a box of our unique handmade Bath Bombs to your mother, teachers, new moms, dad, girl, sister, couples, friend . They suit everyone! ECZEMA, PSORIASIS AND DRY SKIN SUFFERS RELIEF: Our special blend of ingredients in the bath bombs for women have medicinal healing qualities as well if you suffer for skin ailments. Cocoa and Shea butter have been known to give much needed moisture to those suffering from eczema, psoriasis and typical dry skin problems. HEALING FORMULA. The special blend includes Coco Butter, Shea Butter, Castor Oil, Coconut Oil, Sea Salts giving much needed moisture to those suffering from eczema, psoriasis and typical dry skin problems. 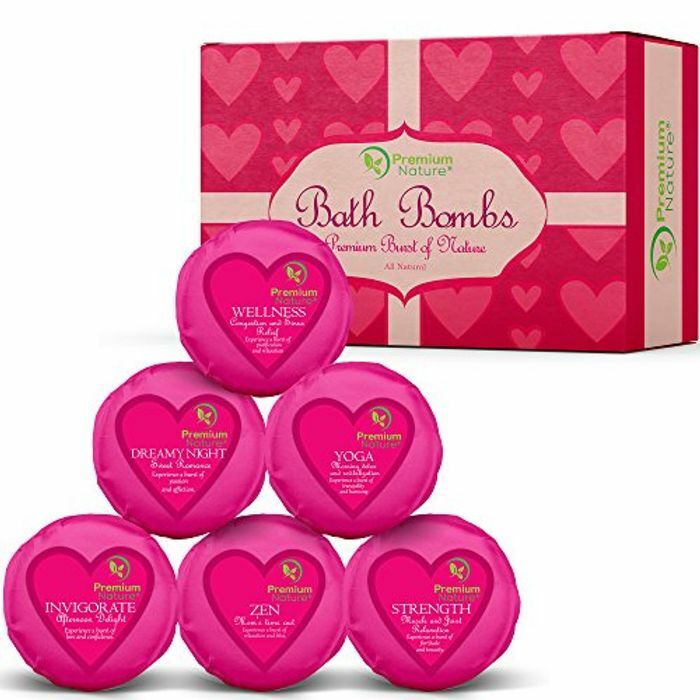 Our Bath Bombs are great as a skin moisturizer, relaxing bath balls, foot soak and more! Awwww these are so cute, thanks so much for sharing! Will be a great prezzie for some of my girls, thanks!